I can scarcely believe it. After flailing around for about two weeks, everything has really come together. Check out my player packs!! Anyone who comes to PAX Aus to play at my table during a session will get a pack. Inside is a letter from the Charter Authority, a Port Breakaway tourist brochure, a player rules cheat-sheet 5 dice, two pins, my business card (for feedback), and at least four stickers. WHEW. On the table will also be the complete alpha, an example spell list, and an example list of breakthroughs, setbacks, and mixed successes. At first I was just going to show up with some character sheets and the rules. I realised that it would be far more fun for me and the players if they could open something physical and have a real experience at the table. When I first began thinking up what should go into these packs, I tried to think of what the in-game characters would be going through. How would they be welcomed to the city after fronting up a large amount of money to get there? Would they get any actual assistance, or would they be offered a “congrats, have a pamphlet”? The decision was obvious. While many countries or cities do have welcome packs of some kind, they’re not always extensive. Most have town history, local business information, maybe a list of emergency numbers. Some are far more welcoming with sim cards (if you’re moving to a new country) or gift cards for the local grocer, since getting on your feet in a new place is pretty expensive. 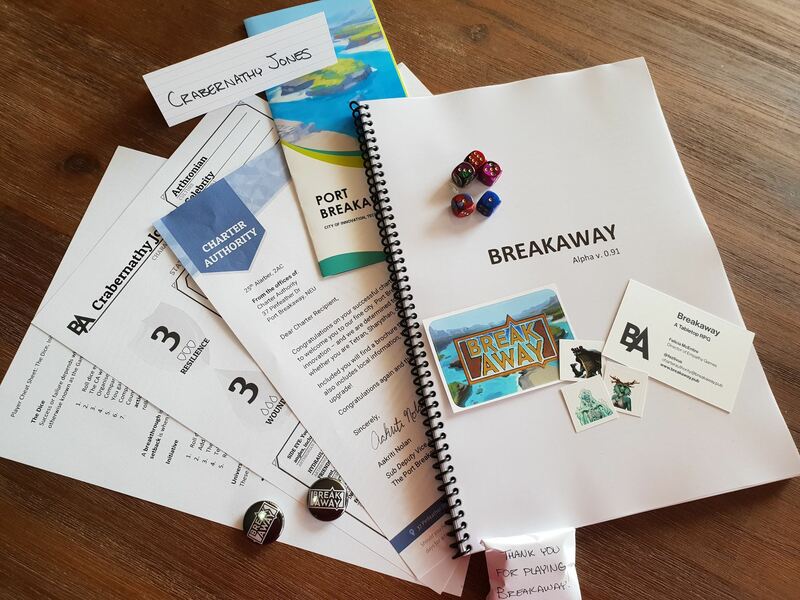 Port Breakaway is not just a city of strange happenings and opportunity, it’s also a place of bureaucracy. The brochure is a generic marketing message about a city of ‘innovation’, and it extols the virtues of the city’s tourist spots and university. On the back, there's even a "Win a Charter Upgrade!" section. Not exactly helpful for a first-time resident, and that’s exactly the kind of tone I want to set here – Port Breakaway isn’t out to help you. Maybe some day it will be better, but for now it’s full of people trying to get theirs. The letter from the Charter Authority isn’t even signed by the board itself (which has several members), but instead the Sub Deputy Vice Assistant of Ratification. Imagine. It doesn’t even speak to the receiver by name, instead saying “Dear Charter Recipient”. Heart-warming! 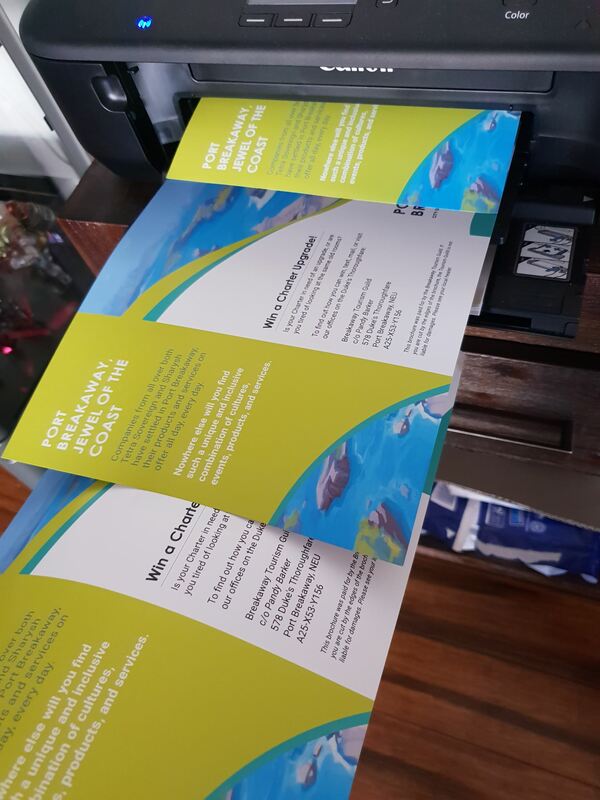 Both the letter and the brochures made me run out of cyan ink – twice. They both have large amounts of blue - the brochure has nothing but green and blue. Something to watch out for in the future, but I think they turned out well. Printing is super expensive, so I was lucky to start with a set of ink before printing - and some very nice paper that has been sitting around for two years or so. Can you imagine the light bulb moment I had when I remembered the fancy paper? I was very excited. The dice packs were probably the easiest decision to make. I have not met a person in the tabletop world who has said, “No, I will not take more dice.” Maybe that’ll change at PAX, who knows! But adding it to the player pack was a real no-brainer. The stickers too, everyone enjoys a good sticker and Josh’s art is too good not to have stickers. Pins were a last-minute addition that turned out nicely, and PAX is known for pin collecting! Aside from the cool frills, the character sheets and the rules cheat-sheet are what players will require the most. 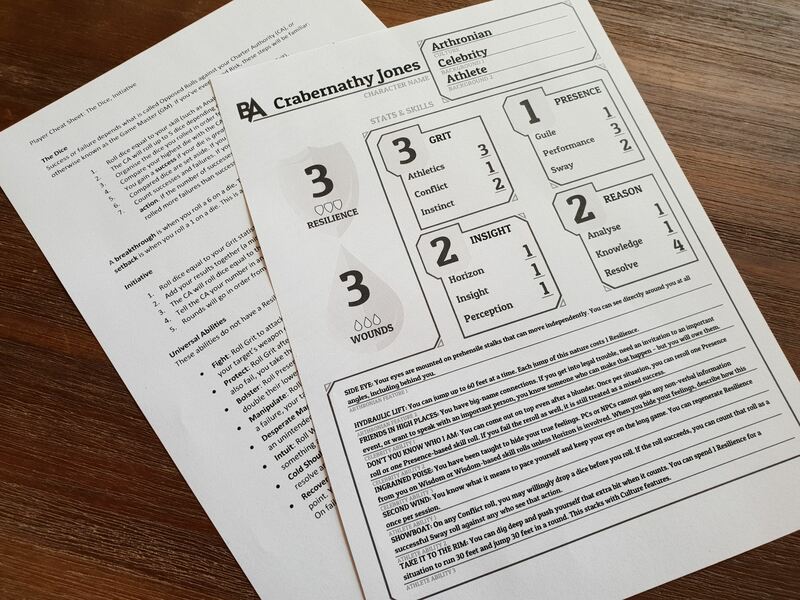 I made the character sheets with large numbers – and then realised that the design means I had to scrunch in ability text. Too late to change now, but lesson learned! Character sheet design is going to really require some thought – I really love the larger numbers so you can see what you have at a glance, but I’d also like to allow players plenty of space for their abilities – and Breakaway will have an ever-growing list of abilities as players progress. The cheat sheet is pretty basic, but a very good basis for where to start for how dice works, combat (if that's encountered at all), and universal abilities that anyone can use. These are the core of what really needs to be tested. If I can get these locked down, then the game pretty much writes itself. 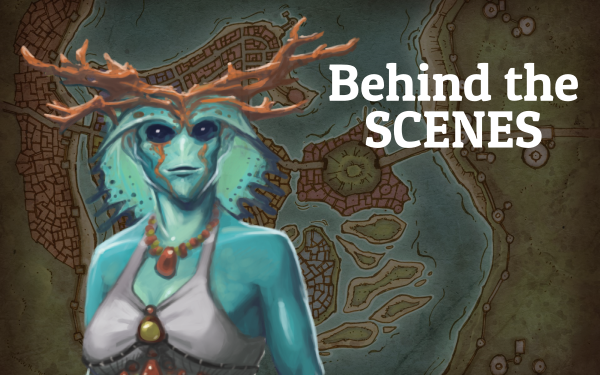 The session’s one-shot is complete – it’s a pretty fun one, if a very quick one. If all goes well, I’d like to flesh it out into a proper module to release online. I won’t be showing it here (no spoilers!) but I will be talking about it later, and how I go about structuring my adventures. I’m really looking forward to running the session, I am genuinely going to have a blast.